Aside from having some f*cking GORGEOUS artwork, I'm perplexed by Captain Phasma. She inherits the ability of Director Krennic, although on steroids as a Power Action, and allows any trooper die showing damage to resolve as Melee damage. So, it affects Executioners, Mandalorians as well as trooper supports, i.e. Vader's Fist, where Indirect damage sides becomes direct damage, but there are clearly cards in the making, or not yet spoiled, that also works with this ability - if not ... then I'll just have to stay perplexed! She does make both your First Order Stormtrooper and Veteran Stormtrooper ridiculously relevant and consistent, especially adding in the new Advanced Training Plot, and her Power Actionis pretty potent, but ... hot damn ... 18/21e ... MAN! You can of course always pair her up with Mother Talzin for what would functionally be a 5 dice start, with the option to go for the allmighty Vaders Fist. I will definatly try her out. His die is great concerning his point cost, but there are strong contenders to compete with. The Battle Droid is super cheap, the FOST is a mixture of both. So it depends on how much points you have left. If its 8 - go for this one. If you play Grievious (new) totally go for this one, for 7 his die is bonkers good. His ability can be useful if you are in need for speed or combine it with a Tactical Mastery. Good ol' FOST. Not great, but perfect to fill that red 7 cost slot. Awesome artwork makes me happy to draw them, even if I already have enough. Grievous is good, don't get me wrong. But there are sooo many contenders for that point cost. Mother Talzin and Wat Tambor to name just two, who I would pick over him. Combining him with some of the available Droid Characters will be at least an interesting deck choice: Some mad man is of course going to field Grievous and 4 Battle Droids - worst thing is it's actually not even going to be that bad! Damn ... those Focus sides are just everywhere and they get bigger - BIGGER! You get a 2 Focus for 9 points, not even Maz Kanata could muster that kind of power! Consistency is really the key to Destiny. Here we have the answer to whether or not the absence of Ciena Ree will be felt with her rotating out. She's been a staple in Snoke vehicle decks because she's cheap has excellent die sides to target with Snoke's Power Action and a ridiculous ability with vehicles. WAT TAMBOR aka Tin Man, fits like a glove ... well ... almost. Wat Tambor is a tad more expensive, but is otherwise almost comparable and has a great Power Action. If you can sequence things correctly, you'll get plenty of mileage out of your Firespray-31, Shadow Caster and Umbaran Hover Tanks! His die sides are excellent for a support character and the 2 Focus side looks terrifying as a Snoke Power Action target in the midgame once your vehicles start popping up! I've already seen people talk about the Snoke/Wat deck, which does sound enticing. No matter what character team he'll end up in though ... Doctor Aphra anyone? ... Wat Tambor looks strong and will definitely see plenty of play! 0 cost mitigation, but it is definitely NOT FREE as you trade a card in your hand to remove a die showing a value of 2 or more. You are then effectively trading 2 cards in hand for 1 die! Wow ... you better make it count! Cards in hand is one of your most valuable commodities in the game and trading 2 of those for a single die is pretty steep. In a resource hungry and focus heavy deck, this is easily first or at least second choice removal. Pay one for either stealing a resource from your opponent or doing 2 damage, that sounds like a solid card, because there are many good leader characters floating around at the moment (Snoke and Wat Tambor to name two). Just stealing a resource can be very powerful and 2 surprise dmg from hand is very good. So in a leader focused deck you could rate it with 4/5. Hand damage has always been a factor and this one is as good as the ones we had before. A well timed Probe can win games. That is probably why we saw it in nearly every competitive red villain deck the past months. Just play it in the right moment and not prematurely target a full hand, except if you desperately need to get rid of a crucial event fast. Two cash for maximum 3 additional damage and the potential for some speed resolve can be good in a mixed damage deck - otherwise it's probably trash. A good card in a droid deck, potentially 4/5 if you go maximum droid advance. Turning two dice for just one resource is great, we can remember Concentrate, which was turning 2 dice for 2 and it was played quite a lot. 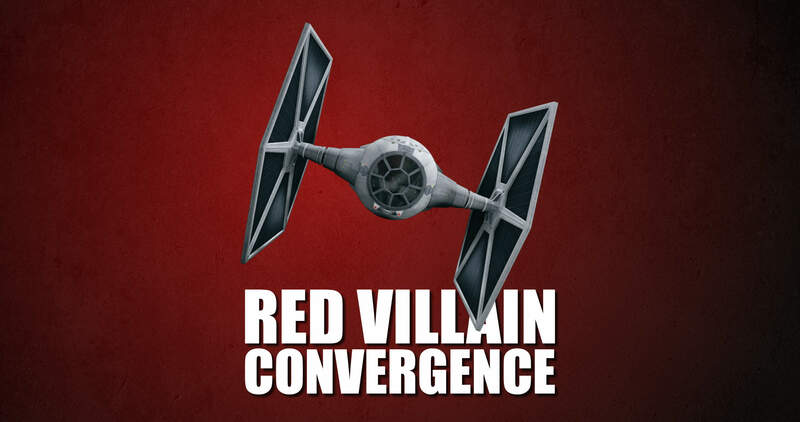 To be fair, its use was mostly in action cheat decks, but red villain has access to that. Like Probe, I love this reprint. Played at the right moment, it can wreck your opponents turn. And its actually a removal card that works against mill as well. In combination with some old and new red characters, this will definitely see play. We do not know if 3+ wide will be a main contender in the upcoming meta. It looks very possible tho. So compared to force wave and the Hover Tank, the Defoliator Tank is more expensive, but its die is so much better. Every side looks resolvable and usually vehicle decks do not have problems with spending one more resource. The hover tank basically costs much more if you include the mod and the payside. Its just one special, I know, but do you know what current characters are not missing? Focus! BUT! Dealing the same or a comparable amount of damage to yourself, makes this card almost unplayable, except in a Grievous Droid deck, which will not have an easy time gathering those resources, I guess. Maybe this one is even 1/5, unless troopers gets a big place in the meta. His dice sides are really underwhelming for 2 resources. Megablaster Troopers can potentially be a MASSIVE card! As in INCREDIBLY powerful. If you spot a Leader it will add three dice to the pool, which is absolutely INSANE! The damage sides are not particularly impressive, but it will add loads of dice to your pool, which in some instances can be even better than a single powerful die side. If you have Focuses around there's a potential 4 Ranged damage and 3 Indirect damage from this beast! AWESOME! Combine it with Phasma and Advance Training to go full on crazy mode. You have to love this droid - it's amazing! Three damage sides and a Discard for just 1 resource. 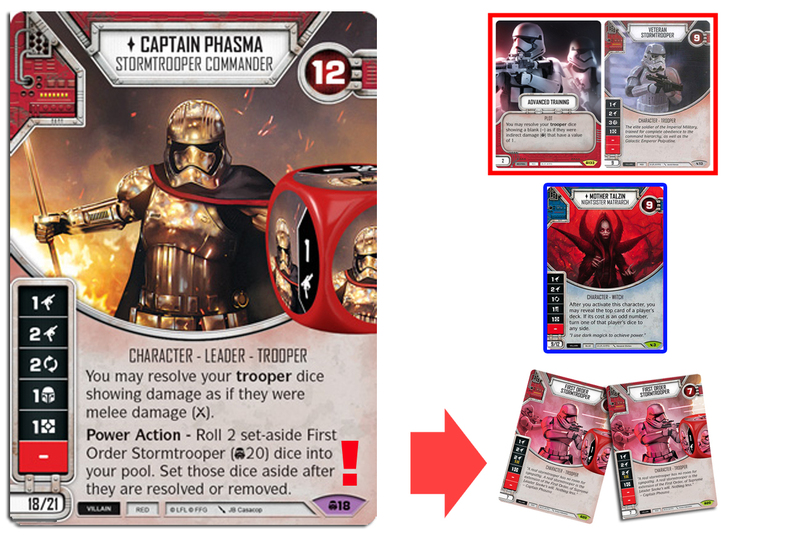 Play it for free in one of the obviously upcoming Aphra decks. It might be so good, that its playable in non droid decks to flood the board a little more. This Blaster has a straight forward, damage focussed die and even redeploy if played on a droid. Since some blasters like Holdout, DL-44 and X-8 rotate out, this could take their place. 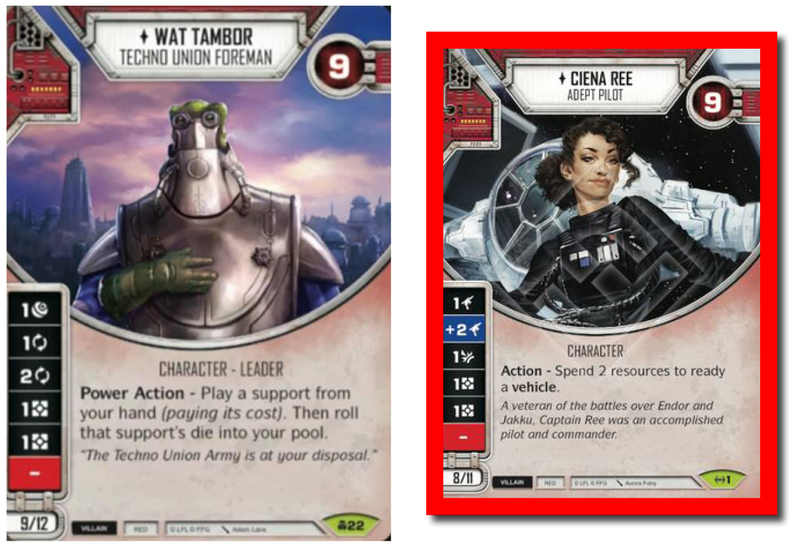 Like Modular Frame a must include in a droid character deck and not a bad choice in a red gun deck either.